English Heritage is revealing a fascinating new display at Corbridge Roman Town, showcasing one of the most significant finds in Roman history. The Corbridge ‘Hoard’ is one of the most influential Roman ‘Time Capsules’ ever discovered in Hadrian’s Wall Country. A new display and interactive digital exhibit, which will go on display to the public from August 1, will breathe new life into this incredible find of treasures at the museum at Corbridge Roman Town. Featuring footage never screened in public showing the actual excavation of the hoard back in 1964, along with a striking new display which show the armour in its original state, adjacent to a replica which will help visitors envisage how the armour once looked. The Corbridge Hoard is an almost 2000-year-old Roman time capsule. 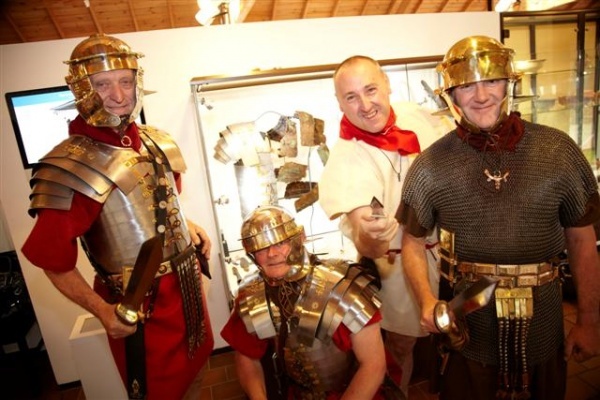 The well preserved objects seem to have been the contents of a Roman workshop and include many of a Roman soldier’s worldly goods – armour ‘lorica segmentata’, tools, weaponry, wax writing tablets and papyrus. Dating from between AD 122 and 138, the contents of the hoard were found in excellent condition, due to the way that they were buried in an iron-bound, leather-covered wooden chest. Roman specialists have long debated why such a collection of possessions should have been buried, but Curators from English Heritage believe the it was most likely a way of securing the material until its owner was able to come and retrieve it. Of course, the owner never came back for it. Kevin Booth, senior curator at English Heritage, explains: “The Corbridge Hoard is one the most remarkable Roman finds of the past century. The armour, found during the 1964 excavations, has since helped to shape our understanding of Roman armour. “Incredibly, when the hoard was first discovered, it was like finding a time capsule from the past – a stunningly preserved piece of history, found in an iron-bound, leather-covered wooden chest buried in the ground, which revealed a great deal about our Roman ancestors. These are very sensitive and delicate objects and it is hugely important that the new display provides the most protective environment to ensure its survival. The exciting new display, aimed at family and adult alike, represents a new direction for the presentation of Corbridge Roman Town. The site itself was an important supply base to the Wall itself, where military supplies and food would be stored. It later developed into a garrison town, a place for off-duty soldiers to take their leave. English Heritage is seeking to provide visitors with a fresh perspective on this internationally recognised collection, ensuring that the hoard is safety preserved and protected for many years to come in the new display. As one of the best preserved examples of Roman armour in history, the hoard’s influence is such that it has shaped the way that Roman soldiers are portrayed on stage and screen the world over. When the hoard was originally discovered by a team of students from Durham University, buried within the centre of Corbridge Roman Town, they were astounded by its remarkable condition. The intricate designs and astonishingly preserved leather and textiles, helped people to understand how Roman armour was assembled and it was this discovery that made it possible to produce accepted reconstructions of this type of armour. The Corbridge Hoard also reveals a great deal about Corbridge as a site and its beginnings as a fort and its development into as a vitally significant supply depot for the Wall. With the new interpretation of the hoard now on display, people will be able to find out more about this major town and supply base in general. Kevin continued: “Modern-day interpretations of Roman legionary armour and re-enactors such as the Ermine Street Guard have looked to the hoard for inspiration. In the past year, English Heritage’s Hadrian’s Wall sites have benefited from a number of redevelopment projects, including this new display at Corbridge Roman Town, as well as captivating new museums and exhibitions at Housesteads Roman Fort and Carlisle Castle. Liz Page, Historic Properties Director for the North at English Heritage, said: “The year has been a particularly exciting one for English Heritage and one which has enabled us to reveal more about one of England’s most important landmarks to the visiting public. The Corbridge Hoard is a new permanent display, open from 1 August. For more information about Corbridge Roman Town and the Hoard, visit www.english-heritage.org.uk/corbridge or call 01434 632349.